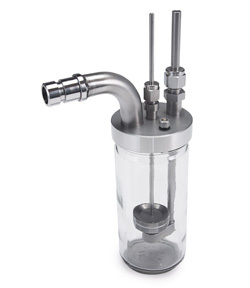 The CH Technologies Sparging Liquid Aerosol Generator (SLAG) is a liquid aerosol generator specifically designed for low air pressure aerosolization of sensitive and delicate microorganisms from an aqueous solution. The SLAG's unique design minimizes physical damage to microorganisms during the aerosolization process with the SLAG delivering close to 100% viable bio-aerosols. A fluid metering pump is used by the SLAG to regulate the liquid flow rate. Unlike many other liquid generators, the SLAG does not use sheering and impaction processes to nebulize the test article. Instead, tiny droplets containing live microorganisms are created by gently bursting bubbles of liquid. The standard SLAG model operates between 2 to 6 liters per minute depending upon the input air pressure. For higher bio-aerosol outputs, a SLAG model with a much larger diffuser disk is available. Thus, sensitive particles, such as microorganisms, participate in the generation process only once and are not influenced by strong shear forces due to multiple cycles and recirculation.